In addition to the topics listed below, Millie can develop customized presentations for your group or organization. Are you ready for a change but feel that you lack the confidence or knowledge necessary to reach your goal? You can begin to move forward by upgrading your attitude. Start by appreciating yourself – who you are and what you have achieved. Learn how to take a Positive Inventory. By raising your awareness of how capable you are, your outlook will shift. You’ll feel empowered and ready to take on the challenges ahead. Each problem that we face presents an opportunity to utilize our intelligence, experience, and intuition. Each of us has an innate ability to face and find our way through or around obstacles in our path. No one is better equipped to find the right solution than we are. In this workshop we will learn to access and appreciate this part of ourselves. We will also learn ten tools to help us approach and deal with whatever challenges come our way. Are you ready to have more of what you really want in life? Do you long for more money or a better job? Would you like to attract a new relationship or to deepen the one you already have? Is there a special goal or project you’d like to achieve? Whatever your pursuit, this interactive talk will teach you practical coaching tools to get you jump started on the road to fulfillment. If you're ready to reach beyond what you've believed is possible, come explore how you can grow your personal and/or professional life to the next level. Using a five-step process, you will develop and hone a vision for yourself. Are you ready to take your professional and personal life to the next level? What stands between you and what you long for most? In this inspiring, interactive presentation, you'll learn creative strategies that will help you clarify what you want and develop a plan to go after it. Life Coaching - What's in it for you? Like its counterpart in sports, life coaching provides the support, motivation, and guidance needed to help people achieve their personal best. Life coaches help their clients gain clarity, create a greater vision for themselves, set and achieve their goals, and persevere during challenging times. Come learn more about this new profession; how it got started and some of the reasons for tis growing popularity. Networking has been called the survival skill of the new Millennium. Although we often hear about how important it is to network, we seldom talk about what makes networking successful. In this session, participants will have a chance to experience networking from the inside out. They’ll learn what works, what doesn’t and how to make the most of their networking efforts. Although public speaking can seem terrifying, it can also be fun and energizing. Potential benefits include increased self-confidence, improved listening and communication skills, and enhanced professional opportunites. This program will include tips on speaking "off the cuff" and thinking "on your feet". Participants will learn how to prepare and present a short self-introductory speech. How long does anything stay the same in your life? The only constant for most of us is change. Ironically, even though transition is inevitable, most of us have a tough time dealing with it. Even when we know that we can make positive changes on our own behalf, we often cling to what’s predictable and safe. This workshop will teach techniques for prospering; no matter what upheavals we face. We will share our wisdom regarding ways to thrive, even when the sands of life are shifting beneath our feet. Ready to start a holistic/healing practice or to take the one you have to the next level? Find out how to reach your target audience, Create the marketing plan that works best for you. Learn proven methods for meeting your inner and outer challenges as they arise. How frightening is public speaking for you? For some -- it's scarier than death! If you're able to break through your jitters, there are many benefits, including increased opportunities and self-esteem. This class will focus on steps you can take to get past your terror and start expressing yourself in public. To take responsibility means to follow through on our commitments even through we may not feel like it. It is always our choice, In this workshop, we will explore our different roles and responsibilities. We will also discuss the benefits of acting responsibly and identify strategies for dealing with our actions and emotion in a positive, constructive manner. If you’re ready to reach beyond what you’ve believed is possible, come explore how you can grow your personal and/or professional life to the next level. Using a five-step process, you will develop and hone a vision for yourself. Are there changes you would like to make in your life, but don’t know where to begin? This workshop teaches an inside-out approach to facing and meeting your challenges. Come learn valuable tools to build your self-confidence and get yourself on the road to success. 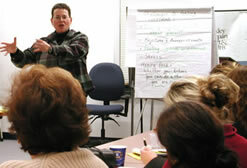 In addition to the topics listed above, Millie can develop customized presentations for your group or organization.